The tragedy in Las Vegas has deeply affected all of us in the community. As we collectively deal with the aftermath, all of us in Las Vegas are trying to come to terms with the unimaginable.And it’s not just Las Vegas – families and loved ones across the country have been impacted, and the ripple effect spreads far and wide.For Work in Progress, Vegas is home. This is where we work, where we live, and where we build our lives. We appreciate the outpouring of support, prayers, love, and donations that have come from people all over the country and the world to help our community recover, and as we come together to pick up the pieces, that support means the world to us.Our connections and obligations to others are the things that keep us moving in troubled times. Without our families, neighbors, coworkers, teachers, friends, and even our creditors, many of us would simply shut down and stay home, overwhelmed by the immensity of this tragedy. Because we’ve made commitments to others, though, our relationships force us to continue participating in life, even when we don’t particularly feel like going through our daily routines.To our WIP family, we ask that you continue participating in life, too. It can seem like a herculean task just going to work in the morning when there are reminders of tragedy everywhere you look, but shutting down and withdrawing from the world around us only hurts the city more. As difficult as it is, make the effort to stay engaged, and we’ll all heal together.If you need us, we’re here to help.Many people have asked what they can do. If you’d like to contribute to Las Vegas, the victims and families, and the other communities that were affected, here are some ways you can get involved. The sheer amount of support and love we’ve received in Las Vegas is overwhelming, and we can’t thank everyone enough for their kindness.One of the most profoundly helpful things that you can do to help is this: visit Las Vegas. Tourism and entertainment are pillars of our local economy, which means that if people avoid Las Vegas for the next few months, we’ll take an economic hit on top of everything else.If you can’t come and visit, you can still help. 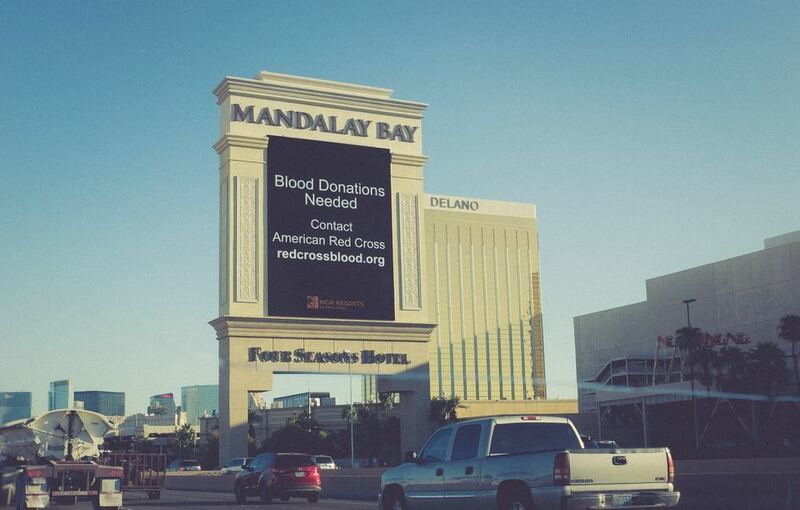 No matter where you are, there’s usually a need for blood donations.In Las Vegas, hundreds of people have flocked to blood donation centers to give blood and plasma. As soon as the news broke, the Las Vegas community rallied to help, and blood donation lines circled buildings.Thanks to the community, United Blood Services have been able to meet the immediate need in Las Vegas. That’s an incredible announcement, and we’re so proud of our city for the way we came together.That doesn’t mean we’re done, though. The supply will dwindle, and in the weeks and to come, there will be a continual need for more blood donations.Even outside of Las Vegas, your blood donations matter.Schedule an appointment to donate with United Blood Services, and you can continue to help even from a distance. Or, visit the American Red Cross to look for blood drives in your area. Later this week, we will make an announcement about the process to distribute the funds. We are working in lockstep with all state and local officials, GoFundMe, and the National Center for Victims of Crime (NCVC) to ensure the funds get distributed directly to the victims and families. We will provide additional information about this process in the coming days. For other ways to donate, see the Las Vegas Metropolitan Police Department’s website for more information on how and where to make donations. Despite what some people may have posted on social media, we in Las Vegas sincerely appreciate the prayers that have gone up on our behalf.For those who are struggling to come to terms with what’s happened in our city, your kindness, solidarity, and support mean more than you realize. Sometimes, knowing that you’re not going through this alone is enough to help overcome the fear and hesitation so that life can resume.There are lots of ways you can reach out to comfort the people of Las Vegas.Simply being available to talk to any of your friends or family that need some emotional support is immensely valuable.If you’d like to reach out to the City of Las Vegas directly, the #Hearts4Vegas program is collecting cards and letters at City Hall to show our citizens how many people care about our community.Even if you don’t choose to donate in any of the ways listed in this post, your kind thoughts and prayers are still most appreciated. We encourage you to be active in your own communities, wherever those may be, and to reach out if you need someone to listen.